The tandem accelerator facility was built for fundamental research with heavy ions, mainly in the fields of nuclear physics, nuclear chemistry, and materials science. Steady operation of the facility began in 1982. The superconducting booster was built in 1993, and the varieties of heavy ion beams available for research have greatly increased. 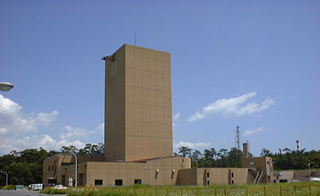 The RNB (radioactive nuclear beam) accelerator was installed by a joint project with KEK in 2005. Further use of the RNB accelerator was terminated in 2011. The accelerator is a device that accelerates various charged particles by the force of an electric field. The JAEA-Tokai tandem accelerator can generate the highest acceleration voltage (18 million volts) of any electrostatic accelerator in Japan, and is one of the highest in the world. It is easy to vary the energy of ions, the energy can be set arbitrarily, and the energy accuracy is high (100 keV). The beam size is small (1 mm Φ). Many kinds of ions are available (50 elements, 200 nuclides).